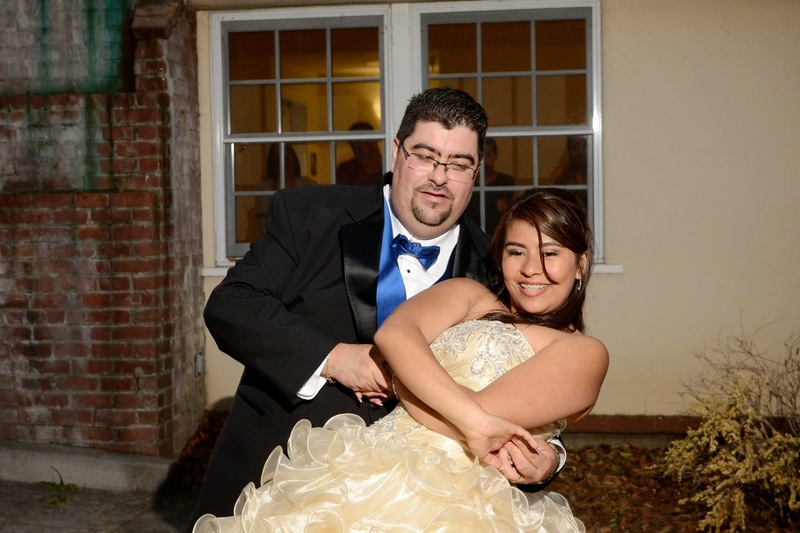 I was asked if I could photograph a Quinceanera by a guest at Brad and Rene's wedding. Having never done a Quinceanera before, I thought it would be an interesting opportunity to practice shooting in a new (for me) "social environment". As I had hoped, it gave me a chance to practice some shooting techniques I don't get to use very often. The Practice Session: The assignment was broken into three parts: the Practice Session, the Full Length Formal Portrait Session, and the Quinceanera itself. Photographing the practice gave me a chance to meet my "Q-Girl", her escorts, and her attendants. After some routine photos of young men and women learning the customary dance steps from the official event choreographer, there was some time for some fun shots. I recalled that Phillipe Hallsman created a series of "Jump Photos" where he made photos of people actually jumping in front of his camera. Mr. Hallsman contended that a person's true personality could be seen at the height of their jump, revealing his subject's unguarded personality. What started as a simple exercise turned into a 45 minute giggle-fest where everybody wanted to be photographed with different people in the party. I certainly managed to break the ice, and I later leaned that the "jump session" was the subject of much discussion that evening, all complimentary. 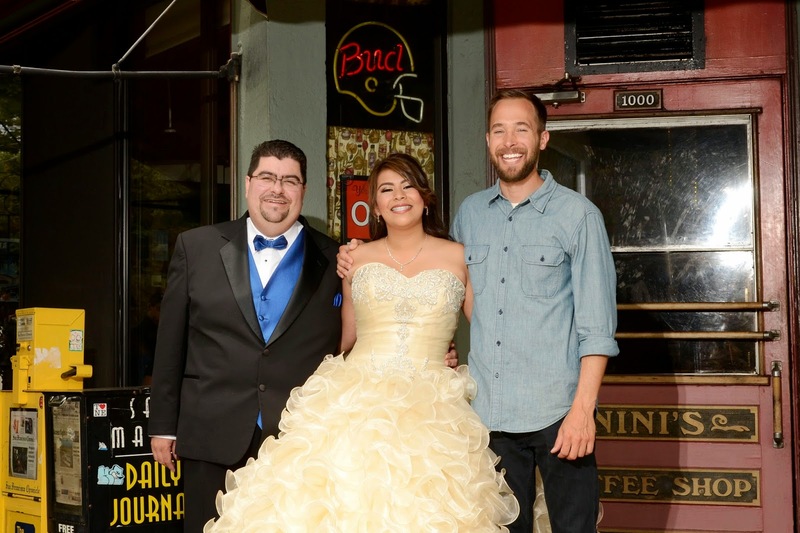 This particular shot (Photo #1) featured Gretchen (center) flanked by her two Quinceanera coaches. Perhaps they just were happy that the day's practice session was finally over. Lighting required two SB-800 speedlights, mounted on lightstands, positioned behind the subjects and aimed forward in a cross-light setup. You can see a bit of flare from the light located at camera right, a sign that the cardboard scrim I attached to the flash didn't work as well as I had hoped. The camera left lightstand was actually cloned out of the final image. The subjects were front lit with a Lastolite EZBox held by my assistant Cissie, who was standing in front of me, just out of the left side of the frame. Unlike the Zumbrella, there is no "back splatter" of light when using the EZBox, and subsequently no contrast reducing flare from within the lens. The Full Length Portrait. Phase 2 consisted of the formal full-length portrait. Gretchen wanted a on outdoor setting, and while there were some suggestions of more exotic locations, I decided that a good compromise would be the San Mateo Central Park gazebo, which was just outside of the headquarters of the San Mateo Arboretum Society. The gazebo was surrounded by well-tended flowers in full bloom, and can be seen in the background (Photo #2). Looking back on this image, there are some minor alignment problems that could have been solved by using a tripod and carefully adjusting the framing. In cases like this, it would have been useful if I had centered the camera on the framework of the Gazebo and moved Gretchen withing the composition, but I purposely didn't bring one because it might have been in someone's way. Learn Something New: For this outdoor portrait I was using two Nikon SB-900s mounted in a Lastolite EZBox II Flash Bracket triggered by two Pocket Wizard Flex units. Nikon SD-8a supplementary battery packs were added to cut recycling time. I used a shoot-through umbrella as a light modifier which Cissie held aloft on a paint pole. I put two ceiling-pointing speedlights on the floor of the gazebo to light the interior. I discovered that if the Pocket Wizards are configured to fire in the manual (not iTTL) mode, the single flash impulse would properly trigger the two optically slaved Gazebo lights. This required a good bit of adjustment prior to Gretchen's arrival, but made for a less complicated lighting solution. 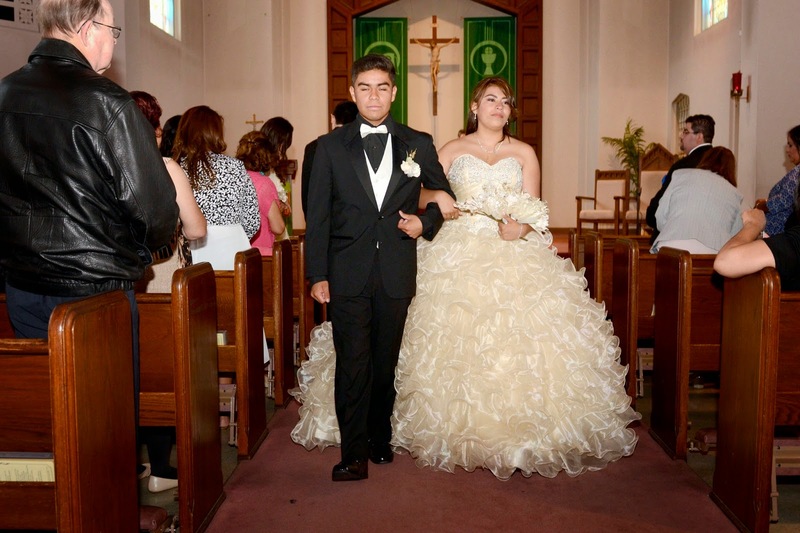 The Main Event: Photographing the Quinceanera itself was very much like a wedding. You'll be required to apply a variety of exposure techniques under a variety of circumstances. For the outdoor shots, I decided to go with 2 SB-900s set to 1/2 power and triggered optically (SB-4 mode) using a camera mounted, fully manual LumoPro 180. My reasoning was that if I was confronted with bright, direct sunlight, I could easily move the flash to my Nikon A or Sony R1 and synchronize my shots at 1/500 of a second or higher, effectively doubling the relative output of my SB-900s. I relied on Cissie to maintain a distance of 10' from the flashes to the subject. No light modifier was used because I needed all of the lighting power I could muster for shooting in bright sunlight. The exposure setting for this shot, taken in the shade of an awning, was 1/250 at F11 (Photo #3). Incidentally, I could have easily cropped the right side glare, but left the image in its original aspect ratio so I'd have some space to crop if I needed to. 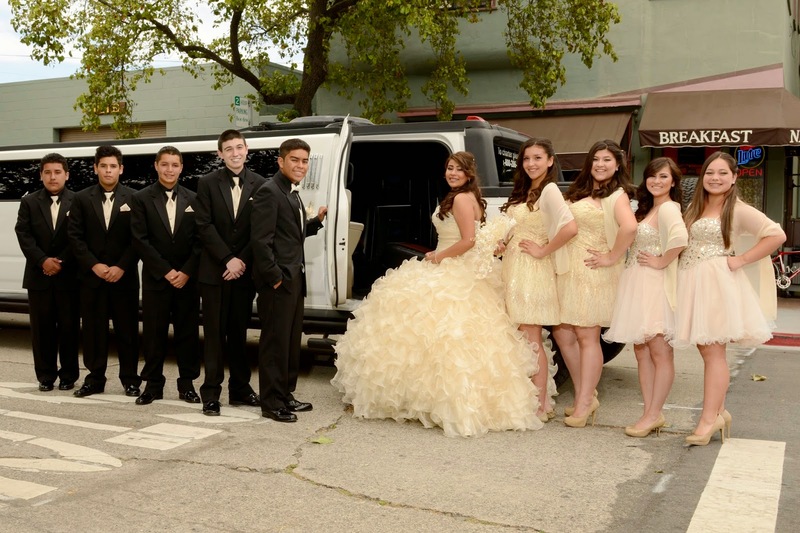 The day was cloudy bright, as you can see by the soft-edged shadow beneath the limo (Photo #4). In this case, the twin speedlights provided the necessary shaping of my subject's faces. Exposure was 1/160 of a second at F10, ISO 200. I wish I had thought to radio-sync a speedlight or two for a shot made inside of the limo, but just there wasn't any time. Indoor Available Light: For the ceremony itself, available light would be the desired mode of operation. 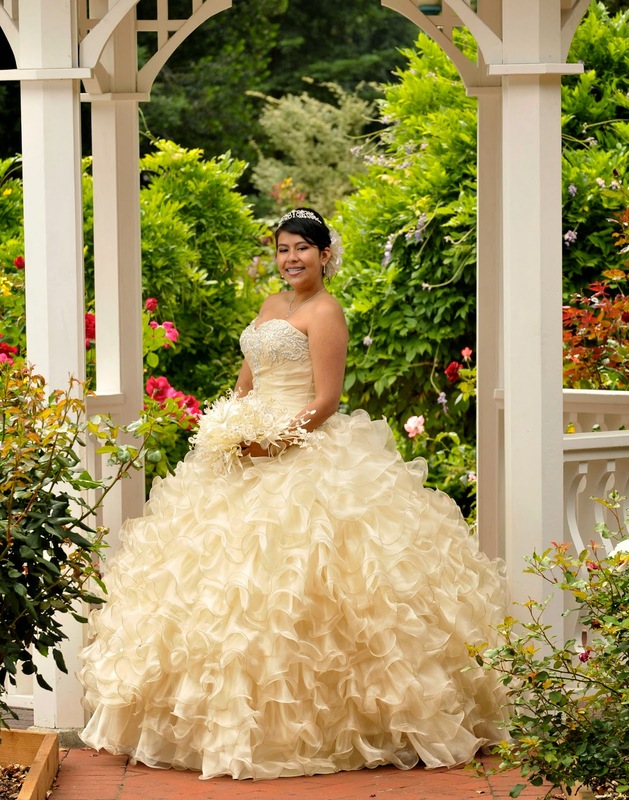 I spoke with the Quinceanera Concierge about using flash. While she said that I was free to use flash EXCEPT during prayer, so Iremoved the flashes from my cameras, opened the apertures, and raised the ISO settings. Digital noise was a real problem at the high ISOs, but I managed to get some acceptable images when the available lighting was relatively even, like this one (Photo #5). Indoor Running And Gunning: R and G means just that: Maximum mobility coupled with high speed shooting. 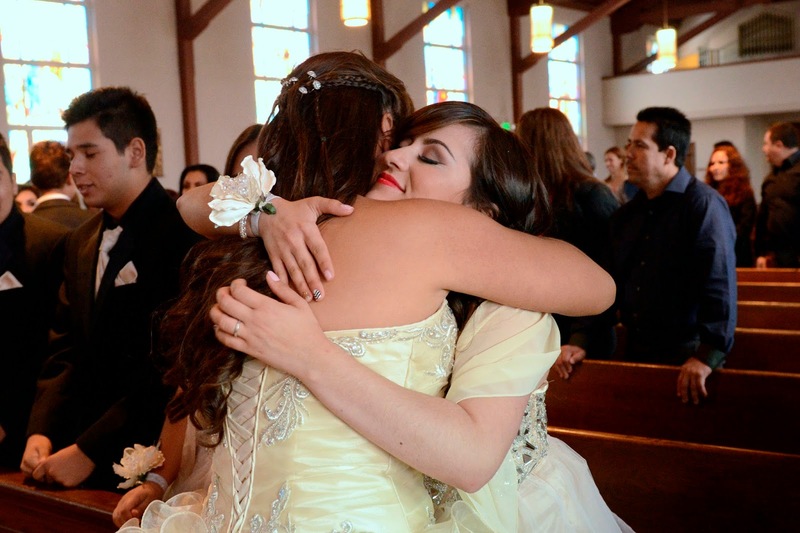 As soon as the ceremony was over, I went to the back of the church to make this flash photo (Photo #6). I set one camera aside just for this purpose. And even with a direct, camera mounted flash, I kept a fairly high ISO setting so the ambient lighting at the front of the church would render enough detail to be recognizable. I am ashamed to admit that I used a shoe-mounted flash because I own several flash brackets that would have brought the light higher above the lens axis. After some obligatory formals, it's off the the next venue. Since we're leaving the church, the approach will be more of a combination of event and journalistic photography, with difference approaches for each new situation, allow me unrestricted use of my speedlights. More to follow.